You always hear about “medical student syndrome,” where first year med students start diagnosing themselves with all of the diseases they learn about, becoming temporary hypochondriacs. They don’t tell you that the same fear can set in during graduate school. Ever since I started my Ph.D, I’ve diagnosed myself with more than a few of the disorders we’ve discussed in classes (whether I actually do have any of them is anyone’s guess). One syndrome in particular has haunted and terrified me every day since I learned of its existence: locked-in syndrome. Locked-in syndrome (LiS) most often occurs when the pons (a midbrain structure that is a critical link to the cerebellum) or the lower brainstem is damaged in some way. This can occur due to a stroke, the progression of a neurodegenerative disease such as ALS (Lou Gehrig’s disease), traumatic brain injury, or some other cause that damages these areas (Smith and Delargy 2005). This is in contrast to patients in a vegetative state, who have damage to the upper brainstem and the brain and a spared midbrain and lower brainstem. A patient with classic LiS is completely paralyzed from head to toe (quadriplegic) with paralysis of the vocal cords which renders the patient essentially mute (anarthria). Patients with classic LiS are still able to move their eyes vertically and control their upper eyelids- a loss of this function is classified as total LiS. In some cases, the damage is uneven between hemispheres, leading to incomplete LiS where some function is spared on one side of the body (Smith and Delargy 2005). A key feature of LiS that sets it apart from other states of consciousness with which it might be confused is that LiS patients are fully conscious and retain all their mental faculties despite their paralysis. 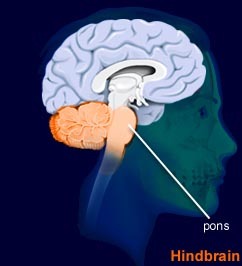 This is due to the sparing of the upper portions of the brainstem and the brain itself. For example, Stephen Hawking’s motor neuron disorder has progressed to the point where he would be considered to be suffering from LiS, and yet he is still one of the greatest minds alive today and continues to produce incredible work. How do you diagnose locked in syndrome? One of my personal greatest fears about contracting LiS is that it could be misdiagnosed as a coma or a vegetative state and no one would know that I was still fully conscious (see Erik Kastener’s Buried Alive post for further nightmare fuel). Luckily, there are ways to distinguish between comatose and LiS patients. One of the earliest methods was through the use of electroencephalography (EEG), which uses electrodes placed on the scalp to record and measure brain activity. Patients with LiS may have abnormal background activity while resting, but will show reactive activity when presented with stimuli. This normal brain activity in reaction to stimuli is readily distinguishable from the lack of reaction in comatose patients, and is a reliable marker of consciousness despite paralysis (Patterson 1986). Another less technological method of determining consciousness is through voluntary eye movement. Patients with LiS generally have spared eye movement in at least the vertical direction and many are capable of blinking voluntarily. Thus, it is possible to administer neurological tests that allow patients to use eyeblinks or movement to answer questions and demonstrate their awareness of their surroundings. 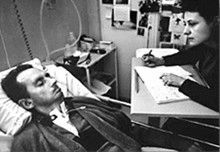 Jean-Dominique Bauby, a French journalist, wrote his book The Diving Bell and the Butterfly (a memoir about living with LiS) entirely by blinking his left eye. What is it like to live with locked in syndrome? Although early sufferers of LiS often died soon after suffering the traumatic event, advances in medicine and technology have allowed patients to survive for many years after becoming locked in (Bauer 1979). While many patients experience some recovery in terms of speech and limb movement, it is not generally enough to allow them to resume life at or near the level that they experienced before the precipitating event. One would expect that after going from being an active, healthy person to one confined to a wheelchair and able to communicate with only eye movements, most LiS patients would be despondent. However, studies have suggested that this is not the case for the majority. When given a questionnaire about their experiences and feelings about their situation, a majority of LiS patients were positive about their future. Patients who were able to socialize and felt a part of a community were more likely to report positive thoughts and feelings (Bruno 2011). LiS patients often report that their imagination becomes a retreat for them in their condition. Bauby’s memoir gains its title from how he felt in his new body. Despite being weighed down and incapable of movement, when he can access his mind “[m]y cocoon becomes less oppressive, and my mind takes flight like a butterfly. There is so much to do. You can wander off in space or in time, set out for Tierra del Fuego or for King Midas’s court.” (Bauby). Technology has helped tremendously to improve the ability of LiS patients to communicate with the outside world. Many of these use eye trackers to interpret where patients are looking on a list of letters or words. A recent study took advantage of the subtle contractions and dilations of the pupil that occur when a decision is made. By training a decoder, researchers were able to create a system that would allow LiS patients to physically change their pupil size to indicate “yes” or “no” in answer to questions. The decoder was successful in 90% of trials, suggesting that monitoring the manual dilation of pupils is a possible way for LiS patients to non-invasively communicate with their peers (Stoll 2013). There are some patients, particularly those with advanced ALS, who are completely locked in and do not have any spared eye movement. 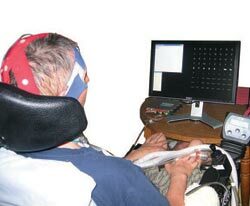 For these patients, brain computer interfaces (BCIs) can provide them with the ability to communicate. One recent study used the principles of classical conditioning to decode differing cognitive signatures for the words “yes” and “no”. They trained the model by asking the patient easy yes/no questions and pairing the “yes” answers with a minor electrical stimulus to the finger. The patient was also connected to an EEG machine and the changes in cortical brain activity between yes and no answers were used to train the classifier. By monitoring EEG signals, they were eventually able to decode yes or no answers at 90% reliability on some days (De Massari 2013). This model may prove to be incredibly useful and freeing for patients who are cognitively aware but have no physical way to communicate with their friends and loved ones. For another look at how locked in patients are working to create assistive technology, check out this amazing episode of the podcast “Strangers”. It follows Jane and her husband Henry, who is locked in. They are an incredibly dynamic couple, and Henry has used his condition to collaborate to develop and adapt technology to allow him more freedom, including a drone that he can fly around outside using his limited head movement to steer. Humans are amazingly adaptable, and as technology advances, there may one day be no limit to what someone who is locked in can do. This post was partially inspired by one of my favorite authors, John Scalzi. His newest book is entitled “Lock In” and takes place in the near future where nearly 1% of the population are locked in and interact with the world through androids controlled by a neural prosthesis. You can read the prequel novella now and buy the novel on August 26th. Bauby, Jean-Dominique. “The Diving-Bell and the Butterfyl”. Random House (1997). Bauer, Gerhard, Franz Gerstenbrand, and Erik Rumpl. “Varieties of the locked-in syndrome.” Journal of neurology(1979): 77-91. Bruno, Marie-Aurélie, et al. “A survey on self-assessed well-being in a cohort of chronic locked-in syndrome patients: happy majority, miserable minority.” BMJ open(2011). De Massari, Daniele, et al. “Towards Communication in the Completely Locked-In State: Neuroelectric Semantic Conditioning BCI.” Brain-Computer Interface Research(2013):111-118. Patterson, James R., and Martin Grabois. “Locked-in syndrome: a review of 139 cases.” Stroke(1986): 758-764. Smith, Eimear, and Mark Delargy. “Locked-in syndrome.” Bmj(2005):406-409. Stoll, Josef, et al. “Pupil responses allow communication in locked-in syndrome patients.” Current Biology2013): R647-R648.